Danielle from Danimezza has Polly as a bridesmaid this week. Bridesmaids, and anything to do with weddings, are one of my all time favourite things. I could write a mammoth post on bridesmaids alone. Oh what the heck, I think I will. 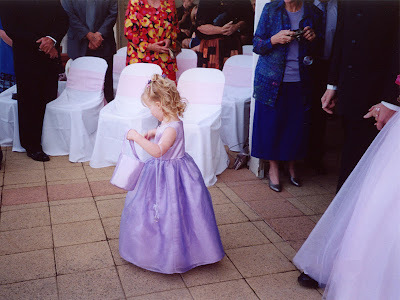 My first bridesmaid memory was when I was four years old and a flower girl for my aunt. 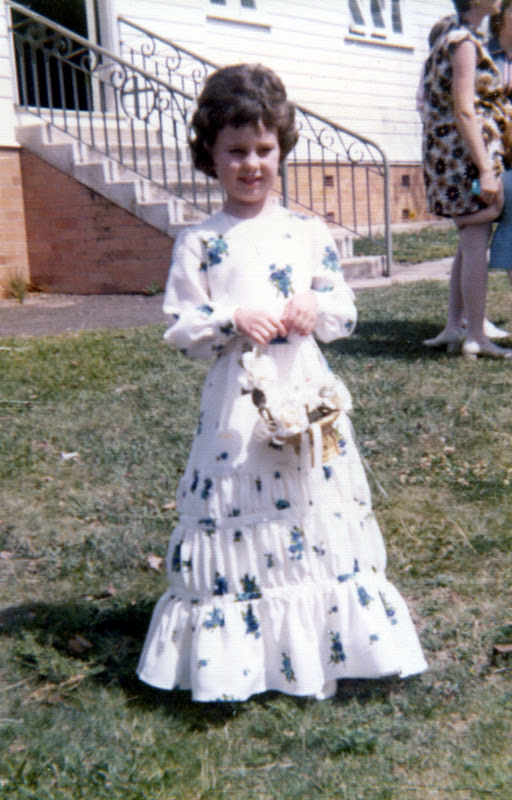 I clearly remember sitting on the counter of the fabric store (Gardams, in Brisbane). My aunty's two cousins and I had picked a lovely ivory crepe with a pink flower print (it was the 70s!). But there was not enough on the roll for our three dresses. So we went with the blue flowers instead. I still can't believe they gave me a grandma hairdo! ﻿When I was a child my parents went to a lot of weddings. We were never invited, luckily our baby sitter lived next door (Nan). 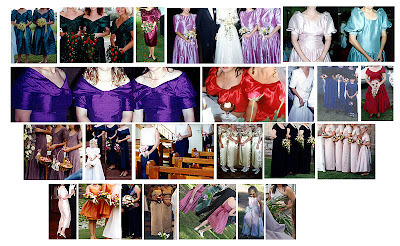 What colour were the bridesmaids dresses? What was the bride's dress like? What kind of flowers did they have? Mum always gave me a detailed description. I was lucky she had an eye for detail, because it would be weeks before I could see photos. No digital cameras back then! Then I grew up and went to a lot of weddings myself, including two of my own! 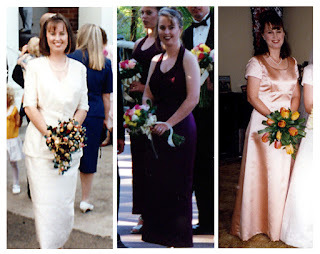 From the 80s to now I've been to 36 weddings, and was a bridesmaid three times. 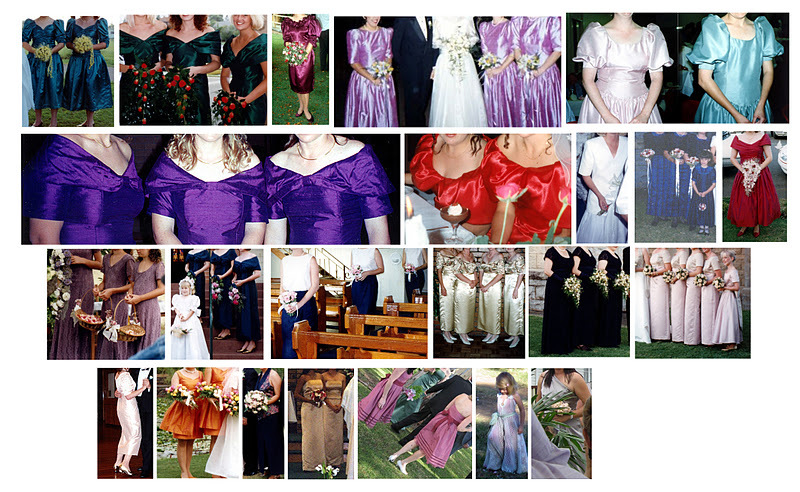 Here's a little collage of the bridesmaids of some of the weddings I was invited to. Some were hideous, some were gorgeous, some have dated well, and some...not so much. I've also made bridesmaids dresses for five weddings and flowergirls dresses for two weddings. Yes, one wedding really did have the Wiggle's colours! For our wedding, we decided not to have any attendants other than my adorable little niece. She was 4 at the time...now she's 13! I made her dress, too. And now, I finally it's Polly's turn! Polly is a bridesmaid this week. OK...so this challenge was a little too difficult for me. This was my short list and I couldn't cut it down so I'm putting them all up. I'm disappointed though that I can't do the full on accessorized set, that would be way too much. Please help me choose, then I can do a full set for just one!! Am Loling at the 80's puffed sleeves though. Anne Girl would have loved them. You're a cutie of a bridesmaid. I love them all but i'd vote for either the 2nd or 3rd ones to see a full set! I think my favourites are the first two of Polly's options. Wow how clever are you! The flower girl is so cute.